Yes, yes. I am well aware that popsicle season is likely well behind us, but I just had to share this recipe, because it's one of my absolute favorite flavors that I made this summer. First off, you *didn't* read the title wrong. These are spicy curry chocolate fudgesicles. Yes. Curry. It sounds crazy, but trust me--it's just crazy good. I started out making just plain old spicy chocolate fudgesicles, which pack a decent kick and potency in and of themselves. 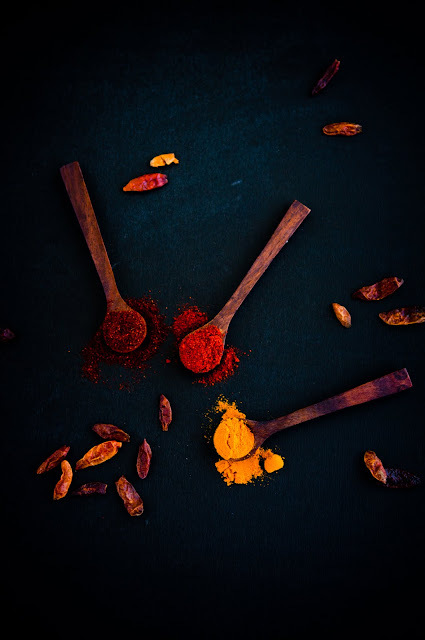 But, as I leaned over to taste the mix, suddenly, I couldn't shake the feeling that curry would go so well with the dark chocolate, cream, and the spiciness. And, since I've learned to always trust my instincts when it comes to food no matter how crazy they may seem, I went with it--and the results were fantastic! The flavor is unexpected but strangely familiar, with the flavor of the curry playing off really nicely against the creaminess and rich chocolatety-ness of the fudgesicle. 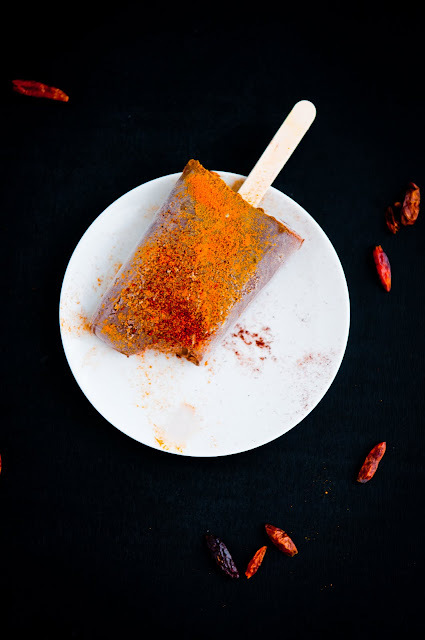 The recipe below uses spicy fudgesicles as the base for the curry fudgesicles, but I highly recommend trying the curry ones--you won't regret it! Here's wishing everyone a happy weekend and warm weather suitable for curry chocolate fudgesicles! 1. Place the chopped chocolate in a heatproof bowl and set aside. 2. In a saucepan, whisk to combine the cream, milk, and cocoa powder. Bring to a simmer over medium heat. 3. Remove the cream mixture from the stove and poor over the prepared chocolate. Let sit for a minute or so and then whisk until smooth. 4. Whisk in the pepper, chili powder(s), and curry powder, if using. Adjust amounts to taste if necessary. 5. Pour the mixture into popsicle molds and freeze until solid, preferably overnight. 6. To unmold, run hot water around the outside of the molds for a brief time until you can easily pull the popsicles out. Sift curry and chili powders over the popsicles before serving. Love this idea, Steph! I've been a big fan of chocolate and cinnamon for a long time, but this kicks it up a few (dozen) notches. Spicy curry spice in fugesicle! wow, I would never imagined it before and because I am intrigued I am going to try it! How did you came up with this idea? @Y: I am so with you there--ice cream and popsicles shouldn't have seasons! @Pam: I've always really liked the combination of spicy chocolate. Perhaps the curry chocolate combo had been floating around in my subconscious for a while? ;-P I know I've seen curry-chocolate bars around since then. I love chocolate and spices! Fudgesicles are a year round food as far as I'm concerned, and spicy warmth just makes them that much more appropriate for fall and winter. I'll be adding your feed to my Google Reader henceforth!